One of the highlights of the Teresa 500 Year was a conference in London. The presentations have now been published as a major new book. For more details, visit our publications page. A wonderful new book by Sheila Grimwood exploring Teresa's rich correspondence is now available. For more details visit our publications page. As part of the Teresian fifth centenary celebrations, a major inter-university congress was held last August in Avila, from 1st - 3rd August. Entitled "St Teresa of Avila: Maestra de Vida" the gathering was a collaborative venture between universities around the world, including St Mary's University, Twickenham. The proceedings of the conference have now been published and can be viewed as a pdf file by visiting the congress webpage. Fr Eugene McCaffrey's latest book on St Teresa, a reader's guide to her Interior Castle, is now available from the Carmelite Book Service. For more details, and to order, please visit our publications page. Baltimore Carmel has now released the full series of talks exploring the theme of Christ consciousness; a dialogue between Carmelite and Ignatian spirituality. Each video comprises a discussion between Sr Constance Fitzgerald OCD and Fr Brian McDermott SJ. ​Please visit our multimedia page to watch. ​All four videos of our Closing Celebrations at Aylesford Priory on 17th October are now available on our multimedia resources page and the Teresa 500 You Tube channel. Enjoy! In September, the Australian friar, Fr Greg Homeming OCD, gave a wonderful course for the Carmelite Family in Britain. The course was entitled "Teresa and the Transformation of the Human Person in a Secular Age" and ran over three days, with four conferences each day, plus question and answer sessions. The entire course was recorded, and we are delighted now to make the packs of audio CDs available to those who wish to benefit from Fr Greg's extensive expertise in Teresian spirituality. Each pack comprises 11 CDs and costs £27 plus p&p. To order your pack, email us here. Our Teresa 500 postcards are now available. Two sets of six cards commemorate our centenary celebrations. 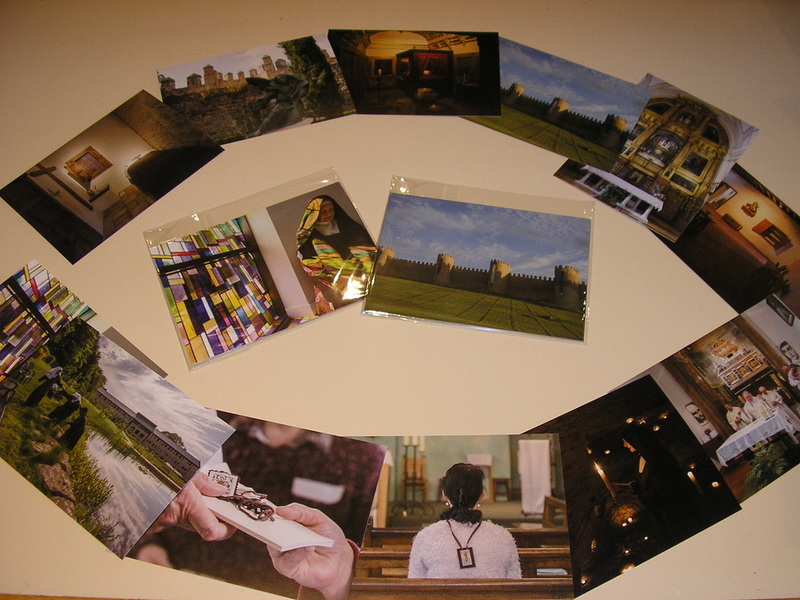 To order your packs, visit our leaflets and postcards page.